Tag line: "Man's Own Creation! Can He Control Machines That Produce People?" 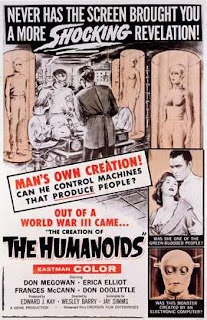 Far from your typical '60s Sci-Fi flick, Creation of the Humanoids presents us with a fascinating world, one it explores by way of a smart, creative story. As the result of fallout from a global nuclear war, the human birth rate has fallen into sharp decline, and mankind is forced to face the likelihood of its own extinction. To keep society going, a race of robots is created, humanoids whose primary duty is to serve. But the robots are not welcomed by all; an organization calling itself The Order of Flesh and Blood has made it its goal to convince the governments of the world that humanoid robots are an abomination, and should be eliminated. To this end, Kenneth Craigis (Don Megowan), a dedicated member of the Order, follows two robots to the home of one Dr. Raven (Don Doolittle). Convinced the doctor is conducting illegal experiments, Craigis and several others burst into his house, just in time to see Dr. Raven die at the hands of a humanoid. But here's the topper: the robot that committed this murder had been altered to look exactly like a man! Creation of the Humanoids wastes no time whatsoever, tossing us into the thick of things right from the get-go, and it's a challenge to keep up as the film branches off in several different directions. 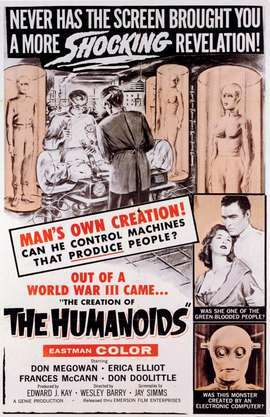 Along with Dr. Raven's efforts to create a robot that's indistinguishable from man, we sit in on a meeting of the Order of Flesh and Blood, at the conclusion of which Craigis is given some disturbing news: his only sister, Esme (Frances McCann), has recently entered into a “rapport”, or romantic relationship, with a robot! Craigis pays Esme a visit to try and talk her out of it, and while there, meets Maxine (Erica Elliott), a beautiful woman with whom he falls instantly in love. To coincide with its jam-packed tale of science and romance, the film also has a lot to say about bigotry. Despite the fact he works closely with the Humanoids, Dr. Raven calls them “clickers”, a derogatory term, and grows angry when one robot refers to the mainframe as its “Father-Mother”. Creation of the Humanoids even throws a few surprises in as well, including a very effective twist I never saw coming. The performances in Creation of the Humanoids are admittedly sub-par, and the set pieces look as if they were made on the cheap. What's more, the movie's underlying message of intolerance is often delivered in a heavy-handed fashion; some characters seem to be giving speeches as opposed to reciting dialogue. But, ultimately, there's enough going on here to take your mind off these deficiencies, and I predict you'll be as surprised as I was at how much content the filmmakers squeezed into a mere 84 minutes. I think I saw this film many years ago. Is this the film where the oppressors are dressed in faux Confederate uniforms? And the downtrodden are termed "clickers". I only saw it once, decades ago, but thought that it was a decent film considering its budget limitations.